As a kid, I can remember so many birthday parties where we bashed the heck out of piÃ±ata. All the bright colors and the best part was the yummy candy. Actually, the more I think about it, the more I remember that the candy wasn't that great. Anyway, I got back over to Jackpotjoy and looked through the New Games tab. 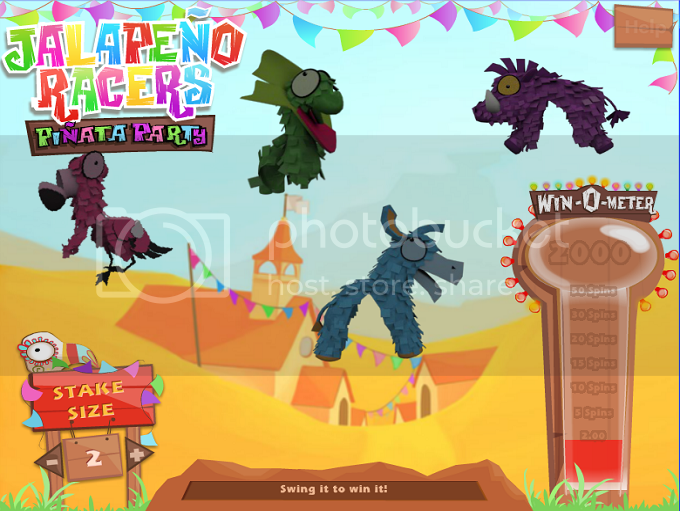 I saw some new Instants and spotted Jalapeno Racers PiÃ±ata Party. I get to bash up some piÃ±atas in the virtual world but instead of bad candy I have a chance to win some cash. I love the design of the slot game and the instant. The colors are so cheerful. You just can't help but fall into a good mood. I played a few rounds at £2 each. Armed with a stick, I hit the pink flamingo, green lizard, blue donkey and purple boar. You may win either cash or free spins. I had a few duds but I loved the free spins. I didn't hit anything major but I felt like a kid again. I redeemed my free spins and wished I got a chance at the bonus but no such luck. This was the most fun I've had at Jackpotjoy in a long time. All I needed now was more cash and a margarita or two.